On November 29, 2018, the IRS released Notice 2018-94: US employers get lucky again! The ACA employer mandate – which remains business as usual after the midterm elections – requires all US employers with 50 or more full-time employees to offer their full-time workers ACA-compliant health coverage. These employers must also provide proof of that offer of coverage to the IRS with year-end forms 1095-C and 1094-C. 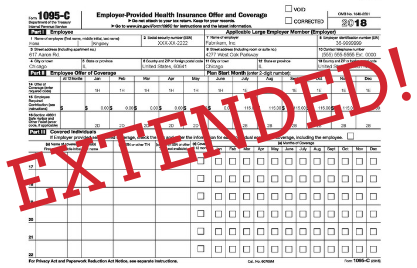 The deadline to provide 1095-Cs to employees has been extended by the IRS to March 4, 2019. Paper filing needs to be done by February 28, 2019. Electronic filing (required for employers with more than 250 1095-Cs) must happen by April 1, 2019. “Good Faith effort” means the IRS will take into account whether the employer made reasonable efforts to prepare for the reporting requirements – for example gathering and transmitting the data to appropriate parties and employer’s efforts in preparing for 2019 reporting.